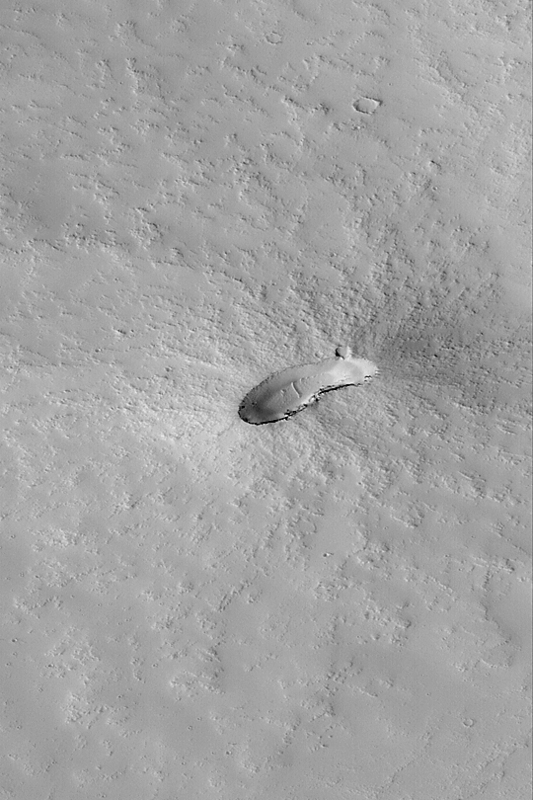 This Mars Global Surveyor (MGS) Mars Orbiter Camera (MOC) high resolution image, acquired 13 July 2003, shows a small, dust-covered volcano on the plains east of Pavonis Mons. The floor of the caldera--the elliptical depression at the summit of the volcano--has a few windblown ripples on it. The ripples and thick dust mantle, together with the small impact craters on its surface, indicate that the volcano erupted some time ago. There has been no activity at this volcano in geologically recent times. This image covers an area 3 km wide by 6.8 km (1.9 mi by 4.2 mi); the aspect ratio is 1 across by 1.5 down. The volcano is located near 1.6°S, 105.7°W; sunlight illuminates the scene from the left.